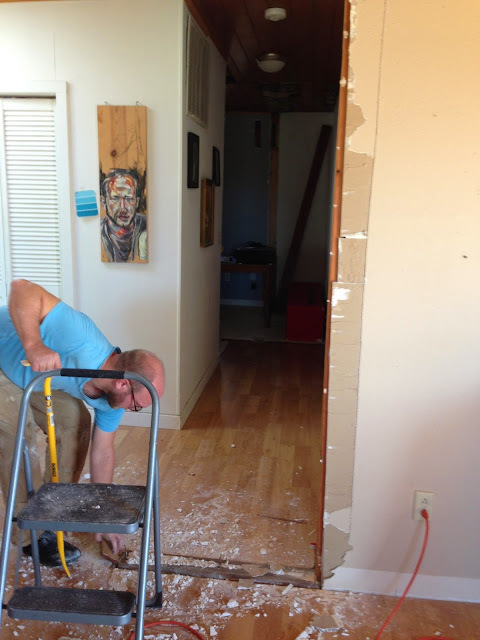 Andrew tackled a huge portion of our Office & Hallway remodel this weekend. 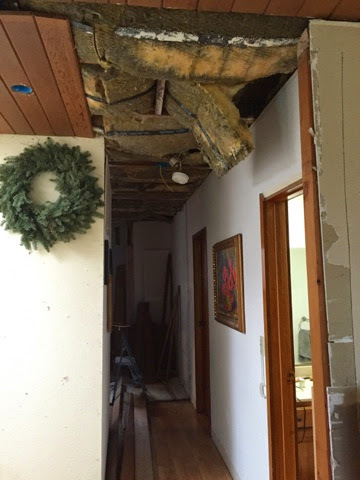 If you remember, way back when we took out the closet and the doorway into what used to be Scout's room (if not, here's the post), there were big gaps left in the plank ceiling, where the walls used to be. Repairing those meant stripping back the rest of the boards, and piecing them back in, intentionally staggered. We decided that while Andrew had the boards off, we should update the hallways lights, move them to make sense with the length and shape of the new hallway, and adjust some weird switch placement near the front door. 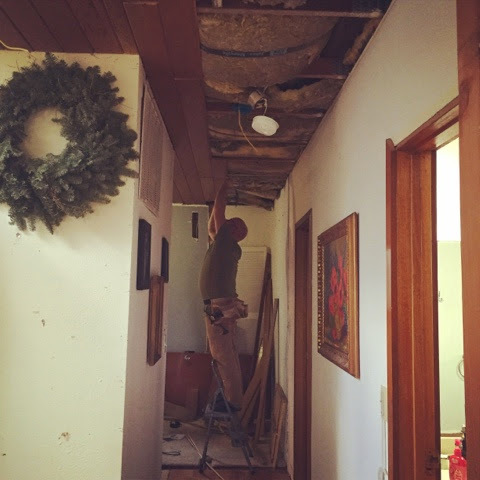 It was a bit daunting to start, because he had no idea what he was getting into with the existing wiring, and he was trying to reuse the ceiling boards because finding a match would be difficult. Here is a picture of the old entryway lights, the placement of them felt awkward and they were pretty dim little lights. If you look down the hallway, you can see that there was one more of the little lights, but it was in a weird spot too, kind of part way in the office and partway in the hall. 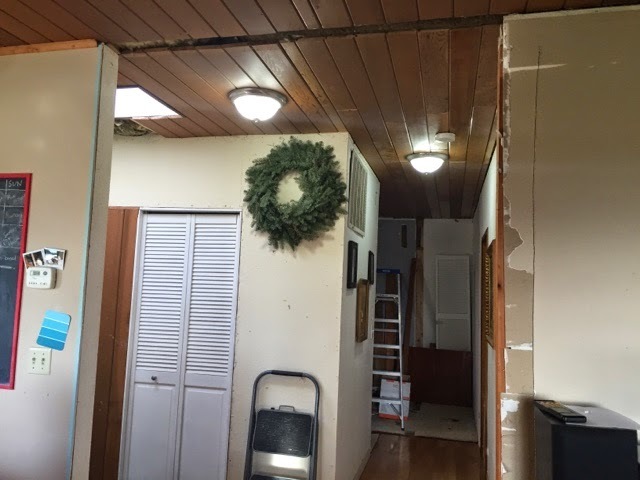 Two brighter, better placed lights up, and patched up (still dirty) ceiling boards. Next step, a new bright ceiling light and fan (to match the ones in our bedroom and the living room!) for the office, putting up a few small ceiling boards, and finishing up a switch for the laundry room. 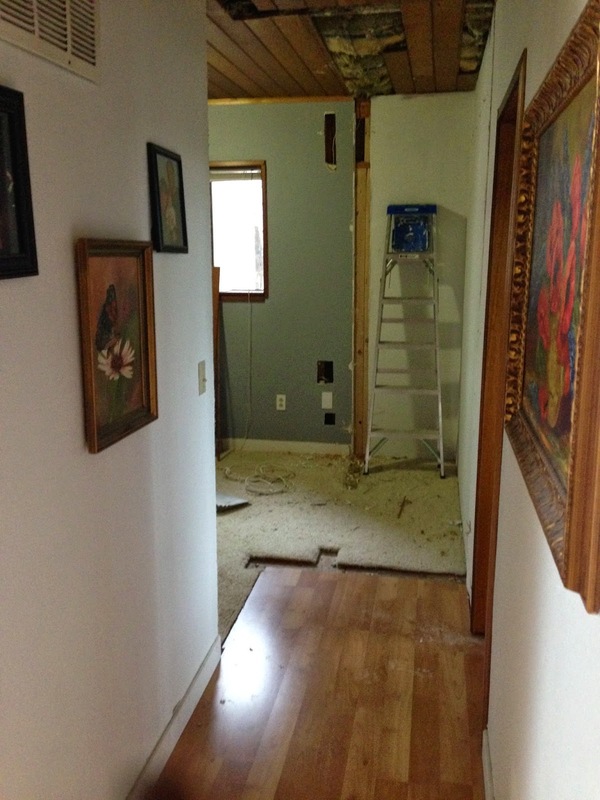 Then there is the big tackle of flooring and patching drywall. Slowly but surely!